Wife Of Steve Mnuchin Goes Full Marie Antoinette - Joe.My.God. 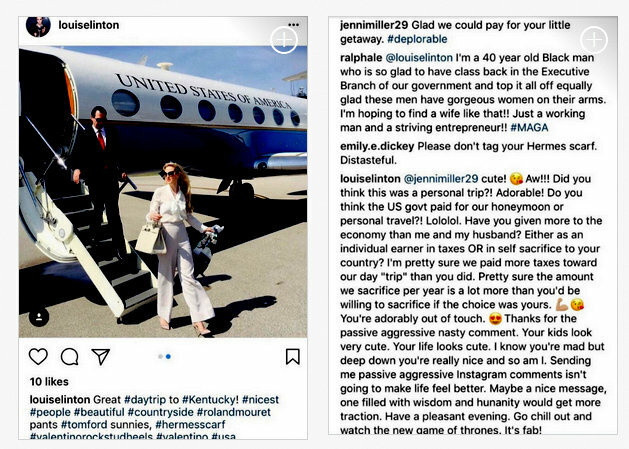 The wife of Treasury Secretary Steve Mnuchin went on a tirade after an Instagram commenter criticized her for posting a picture of herself disembarking a government plane. 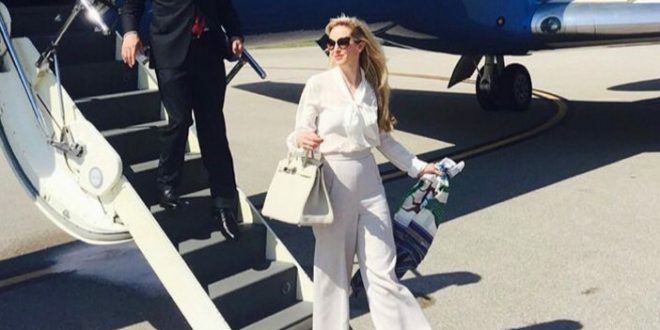 Louise Linton, a Scottish actress who was famously ridiculed for writing a “white savior” memoir about her time in Zambia, posted a photograph of her and her husband descending the steps of a government plane on Monday. “cute!….Aw!! Did you think this was a personal trip?! Adorable! Do you think the US govt paid for our honeymoon or personal travel?! Lololol. “Have you given more to the economy than me and my husband? Either as an individual earner in taxes OR in self sacrifice to your country? I’m pretty sure we paid more taxes toward our day ‘trip’ than you did. Pretty sure the amount we sacrifice per year is a lot more than you’d be willing to sacrifice if the choice was yours. “You’re adorably out of touch. Thanks for the passive aggressive nasty comment. Your kids look very cute. Your life looks cute. Linton, 36, married Mnuchin back in June after meeting him at a wedding in 2013. While the treasury secretary, 54, tends to keep things business-casual, Linton is famous for her over-the-top outfits and ensembles — many of which cost well over $10,000 when counting clothes and accessories. “Curiously this Instagram post is no longer available. F–king hedge funders,” wrote one Twitter user. “Louise Linton is a hideous person, growing fat off of our tax dollars,” another said.